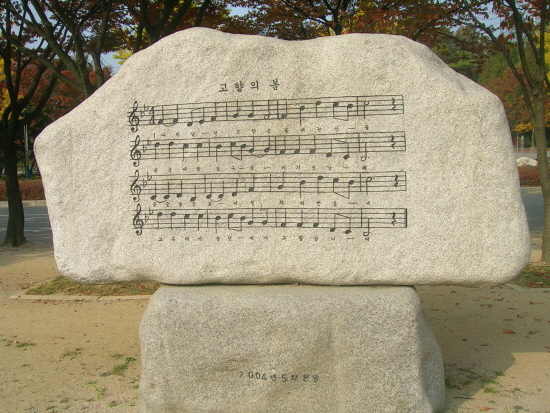 “고향의 봄” is one of the most beloved and well-known Korean songs of the past century. Categorized as a children’s song, or dong-yo (동요), the title translates into something along the lines of “The Springtime of My Home(town)”. The lyrics were first written as a poem by the children’s author 이원수 (Yi Won Soo) when he was in his early teens (that is, around 14 or 15). 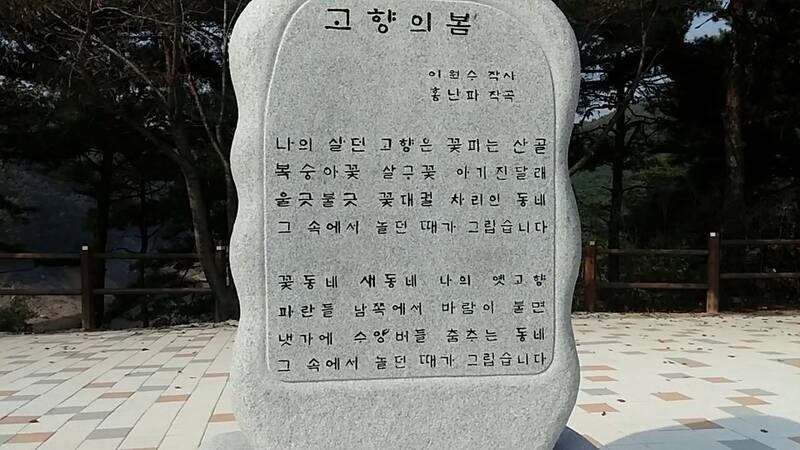 The poem evokes his own recollections of home and was published in 1926 in an issue of 어린이, a children’s literary magazine. The poem was adapted into a song twice, and the second adaptation by the composer 홍난파 (Hong Nan-pa) brought the song into the Korean mainstream. The song flourishes inside karaoke rooms, national broadcasts, albums by K-pop groups, and the hearts of Koreans on the peninsula and beyond (and I’ve included a playlist to share some of the song’s recent versions). The song and its lyrics are also memorialized in stone (as seen in the images below). I’m interested in how this song evokes, creates, performs, and complicates “home”. It was written by a Korean teen who was born into and grew up in a Japanese-annexed Korea. During colonization, the song allegedly captured the sentiments of Korean independence fighters who had left home to participate in the independence movement from abroad. Post division, the song is a popular symbol of home in both North Korea and South Korea. Today, the song serves as a pastoral counterpoint to apocalyptic “Hell Joseon”. I remember learning the song during music class on Saturdays at the Korean-American School of Atlanta. The song planted in me an idea of a Korean home I could share with my parents, my grandparents, and other ethnic Koreans. Learning the song was a part of my inculcation into a modern Korean national identity. Reading selections from The Queer Art of Failure by Jack Halberstam made me wonder about finding counterhegemonic ways for practicing “Korean-ness” as a Korean-American and member of the Korean diaspora. Looking back, Korean school presented me with a nationalistic, hegemonic approach to Korean identity. “Mastery” meant gaining fluency in a very specific kind of Korean language, speech, and culture, that is, textbook “Korean-ness” centered on South Korean politics. It didn’t account for any erasure of experiences and identities that occurred as Korea modernized by way of colonization, brutal military dictatorships, and crushing hypercapitalism. We never ever discussed why we were at a Korean language school in America, or what role Korean-Americans played in United States beyond participating in the model minority myth. As a whole, my classmates and I were encouraged to embrace success—our job was to represent the Korean people in the world. I won so many awards in Korean school for performing Korean-ness—and to what end? In this sketch, I would like to explore an idea for a performance that engages with nostalgia and a failure to find a home. I will perform “고향의 봄” (a song dear to my heart), from memory and to the best of my ability, on a dub siren I made using a synth kit from Tech Will Save Us, a company that makes educational electronics kits for children. Using the dub siren, I will perform and recall the song through a synthesized voice. When I “sing” the song, I will piece together the tune based on what I hear and what I can listen to in my head, heart, and in the room. I will engage in making, unmaking, and remaking the song’s melody. While failure is inevitable and the resulting song will be unstable, and perhaps unrecognizable, I hope the failed song can offer a small moment of respite from needing to perform mastery of a home while expressing a longing for one. What can home, or an attempt at calling and recalling home sound like? What home am I missing and does it exist anywhere? Is there room, is there an audience, for an imperfect home song?